It’s happened before, a business user brings up an excel spreadsheet with some critical macro that needs to be fixed or updated. Except whomever wrote it protected the VB6 project with a password, possibly to hide database connection strings or other such protected data. However, that person is not available, long gone, or simply doesn’t remember. The business logic of the macro is a long forgotten voodoo, so rewriting from scratch just isn’t an option. No matter. Googling around will find a few available methods to do this that involve editing the file to replace the password, or to invalidate the password. Sometimes these work, sometimes they don’t. 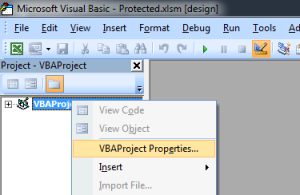 I had just such an occasion where the file editing methods(that I’ve used successfully in the past) just resulted in corrupt files or repeated error messages trying to open the VBA Project. So I’m presenting here an alternative method. 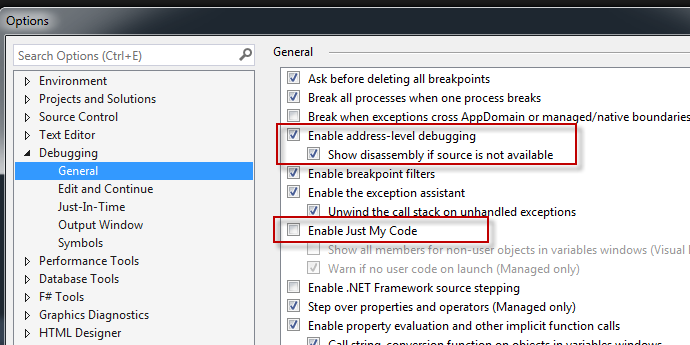 Since I am a software developer, I decided to try to use Visual Studio’s debugger to skip around in the code. If you don’t have VS, and are desperate to unlock a macro, the current ‘Community Edition’ is free, although its a hefty download and install, and it may be a bit much if your not used to software development. But I’ll go step by step so you can follow along. First, fire up the Excel spreadsheet and Visual Studio. I’ve prepared a sample workbook and protected the VBAProject with a password and set the ‘Lock project for viewing’ flag. 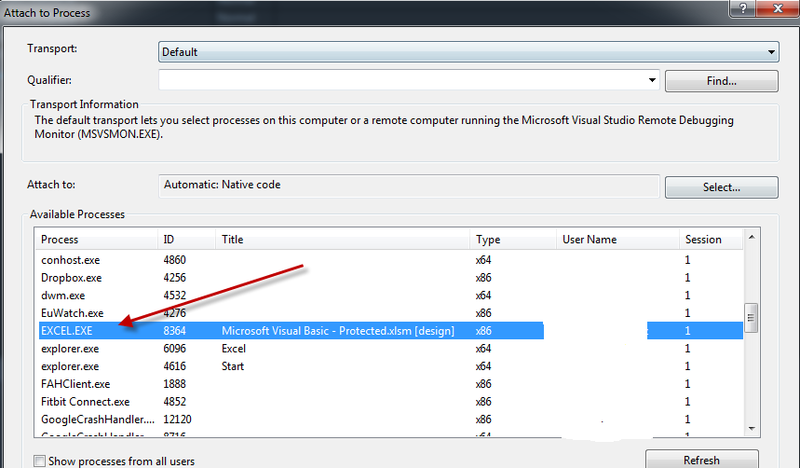 In VS (I’m using Community Edition 2013), go to Tools > Attach To Process, then attach the debugger to Excel.exe. Now, ensure your options are setup for this, which they probably are not by default. 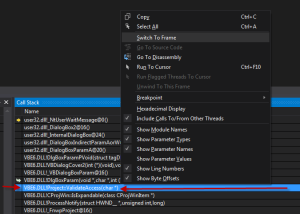 Debug > Options and Settings, uncheck ‘Enable Just my Code’ and check ‘Enable address-level debugging’ and ‘Show disassembly if source is not available’. Now go to Excel and right click on the VBAProject in the tree on the left, and select ‘VBA Project Properties’. 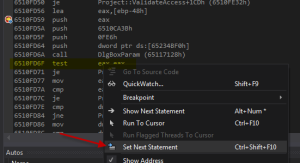 Now that you have the password prompt, go back to Visual Studio and hit the break button. 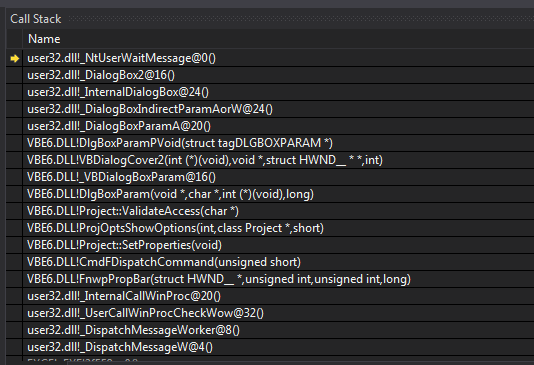 Now, ignore the assembly code you are faced with and find your call stack window. 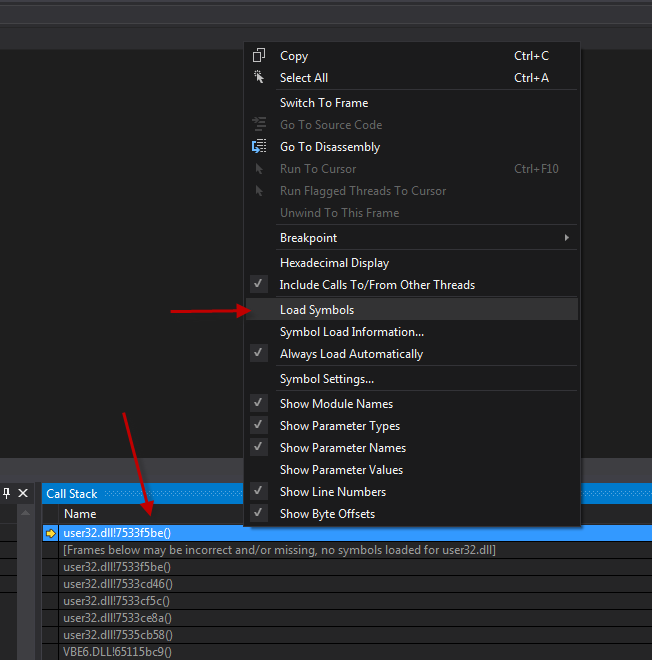 To help us out, you should be able to right click one of the stack frames for both user32.dll and VBE6.DLL and select ‘Load Symbols’ (So you hit load symbols twice, once for each dll). 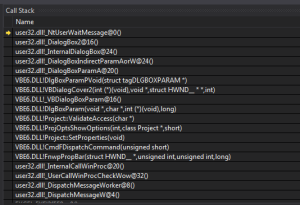 Now this should automatically get the debugging symbols for both these dlls from the Microsoft symbol servers. This is helpful because it gives us function names in the stack trace instead of just meaningless addresses. Your call stack should look like this now. If it doesn’t look like this, it’s possible you happened to stop on another thread. Hit Continue and Break again, and see if it looks better. 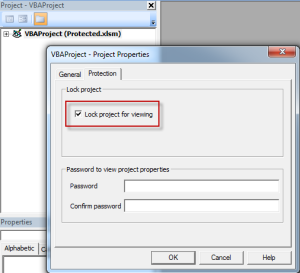 Double click on the stack frame for VBE6.DLL!Project::ValidateAccess(Char *), or right click and select ‘Switch to frame’. 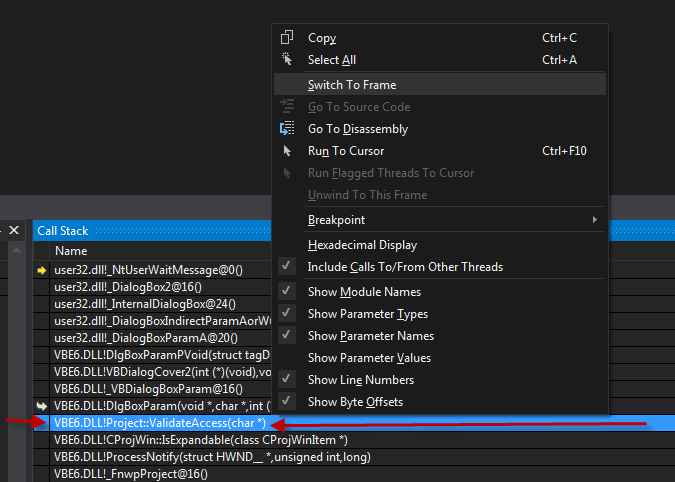 You should be brought to the assembly code with the cursor just at the line after the Call instruction to DlgBoxParam. Before that call you’ll see a series of Push instructions. If your not familiar with assembly, the four pushes are the four parameters that that function takes. You’ll also notice there is no Pop instruction after the call, meaning the function doesn’t return a value. Now what we will do here is place a breakpoint on the first Push, which will stop the program just before it executes any of the pushes. What we are going to do is skip the call to DlgBoxParam, and we have to skip the related Pushes too, or we will unbalance the stack and crash Excel. 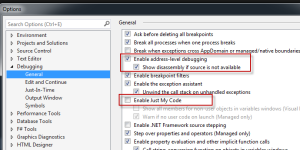 To place the breakpoint, just click in the area just to the left of the source window. Now hit continue, go back to excel and cancel out of the password dialog. Then try to go back to the project properties. 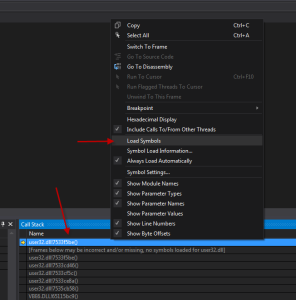 This time you should hit your breakpoint in VS. Just right click on the test line right after the call instruction and select ‘Set Next Statement’. You’ll see the little yellow arrow is now at that line. Hit continue (F5). Now just go to the Protection tab, uncheck ‘Lock Project for Viewing’ and hit OK. Note, this doesn’t clear the password. If you save and close, you will be prompted for the password again to access the project properties, but you cleared the viewing protection so you should still be able to view and edit the code. However repeating this method does not allow you to turn the viewing protection back on without resetting the password to something new. 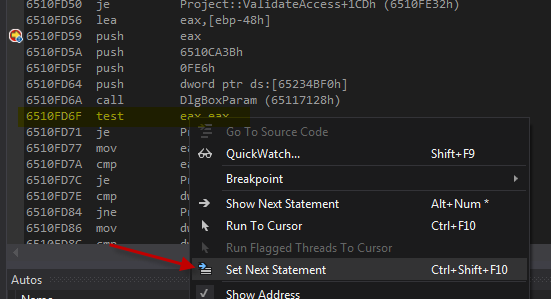 Alternatively, if you want to leave the macro protected with the mystery password, you can do the same procedure, just click the plus to expand the tree to get the password prompt, instead of entering the project properties. This way, you gain access for just your session, and the viewing protection resumes once you exit and reopen excel. Like always, hopefully someone will find this little trick useful. Thanks for reading. Since this wasn’t a real problem that needed solving (just a though inspired by something I saw), I used this as exercise to expand my knowledge. I’m not sure how exactly I decided to look at XML as an alternative, other than it was something I had only just touched on a few times in TSQL and didn’t fully understand. It seemed like it could contain all the magic I needed. I’ll include a full example script at the end, but I will walk through each of the steps below. As a disclaimer, I am not an XQuery expert, and I learned a lot by creating the below code, so if you feel any of my explanations are wrong, let me know in the comments please. First thing, for this example and proof of concept, we just need a example table with a primary key. We won’t put any data in it, we will just populate example inserted and deleted tables to simulate the trigger (or any other situation where you may have before/after data to compare, this isn’t limited to just trigger use). The main goals we are working towards are a dynamic join, and a dynamic column to row transpose operation. That’s our example table. We’ve created a table, because we wan’t to get the primary key information from the INFORMATION_SCHEMA tables. The key information will be needed to perform the join. I tried to eliminate any concatenation and casting to XML, but this was the easiest way to get the key column names. With @PKey initialize, we use the SELECT = method to concatenate the column names together as XML tags, and afterwards we cast that as actual XML type variable. We will also need our example before(deleted) and after(inserted) data for the rest of the experiment. With our example tables, we are going to transform the data to XML documents, using the FOR XML AUTO syntax. FOR XML causes the results of a query to be create as XML data, and the AUTO basically means that the schema is automatic based on the data. This generates an XML document like this. Each row is an XML node named after the table alias, and each column is an attribute. There is no root node. With the data, now we need to include the key information, so we can do the join in XQuery. This is done by using the modify XML function provided by TSQL. This can be called where TSQL expects data to be changed, such as an UPDATE or SET statement. So in the above code we are first setting our variable to a basic XML document to put our data into, and using the insert statement inside modify to put the data and key into the document. The sql:variable syntax allows us to grab data from other variables and use it in the XQuery, as by default only the XML data of the column/variable we are in the context of is avaliable. The into clause specifies the node we are inserting into. Using XPath syntax we use (/root/values) as the location for our data. This means that from the root(/), get the node root then the node values and use the first one you find . The same is done to insert the Key names into the document. This results in the below XML. Now here’s were it starts getting fun with XQuery. Using the TSQL query function, we can run XQuery to generate new XML based on our existing XML. As a side note, this function only accepts string literals. That means no dynamic XQuery from columns or variables, you would have to do a dynamic SQL statement to achieve that. We are going to use this query to grab our data and append a key value to it by joining the attributes from the data nodes, to the primary key column name nodes. This makes use of FLWOR syntax to provide looping functionality that we need to pull this off. It’s also important to note here that XQuery is a functional language, which means you have to think only in terms of loops and recursion. The syntax here I struggled with the most, as it wasn’t always clear from the error messages what I was doing wrong. The above is the same thing twice, once for each set of data. To summarize what the XQuery is doing, we are iterating using the $r1 variable to loop across all the nodes underneath /root/values/, which will be all of the ins or del nodes. We are then returning a a new del/ins node, that contains $r1. The curly braces are used to show that you are changing back to an expression from literal XML tags. Without them, it would return the literal string $r1 to the XML output. Now, we attach our keyvalue node that will contain the a generated key string for the row based on its primary key columns. This is done by using a double for loop across all the attribute nodes @* of $r1 as $a1 and all of the nodes that are below /root/pkey/ as $ka. The were clause of the loop specfies the criteria for returning the data in the loop. In this case we are using the local-name function to match the attribute name to the primary key node name. These means that for every column that is part primary key, we will enter the loop body. Inside the loop we use the concat function to create a string that will be a single quote and comma delimited list of values that will be a single unique key value string for the row data. The data function is used to return the value of the attribute node. This results in the below XML. Now that we have a unique key value inserted into the before and after data, we can do a join to match up each delete with it’s insert. The nodes function basically creates a table where each row is the individual node returned by the query expression. These tables must be aliased and the expression T(m) creates it as the table alias T with column m. Poorly named, I know. So, we are basically joining two tables where each row is the ins or del node that contains the child ins or del node and the keyval node. The value function is used to retrieve a node value based on an XPath, and requires a second argument for what value to cast to. In this case we are saying that from the current node (.) get me the keyval node below it, and then the text() node below that, and return the first result . In this case I’m doing a where clause join, and will only detect changes. You would have to alter there join in order to return new records or deleted records. From here I simply select the current node for both rows and use FOR XML AUTO to get yet another XML document. The resulting XML would look like this. The T node comes from the poor table alias I assigned, but we will roll with that. So, now we have matched before/after (deletes/inserts) values. Now the second part of this was to transpose the columns to rows, to to a column wise result. This is done with the below XQuery. So for this one we start by looping on each node under the root of the XML as $r1. We are returning each of these under a change node, which will contain a key node, and several item nodes for each column that has changed. One thing I have noticed, is that context can affect the performance of an XQuery quite a bit. When watching these queries using SQL Server Profiler, reorganizing your queries to avoid expressions that return to the root of the document and instead work off of the current context can help speed them up quite a bit. For our item loop, we are going to do another double loop to iterate across all the attributes for the before and after values using the $r1/del/del/@* and $r1/ins/ins/@* XPaths. The where condition again uses the local-name function to match the attribute names, and since we are only interested in changes, we only wan’t to look at items where $a1 is not equal to $a2. 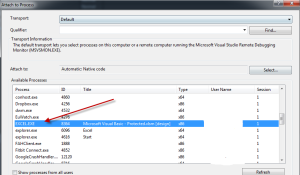 In this case we return an item node that contains the column name as well as the old and new value. This results in the below XML. The last part is just to select this change data in table format, so it could be inserted into a logging table for later review. Again, we use the nodes function to return a table based on the nodes we want to select. In this case we specify an XPath that takes us right to each item node. We then use the value function again along with a relative XPath to get each of the columns we want. The . refers to the current node, which will be item, and the .. refers to the parent of the current node with will be the change node. This is important as we stuck the key value (used to identify what entity the the change applied to) in the change node above the item nodes. This results in the below output table. And that’s it. I learned quite a bit writing that, and I hope you learned something from reading it. Below is the complete example code, which was tested on SQL Server 2008 Express. Enjoy. I recently picked up this old portable DVD player marked “Doesn’t Work” for cheap at the local junk shop. My intent was to figure out the LCD interface and attempt to drive the display. This article is just the investigation. 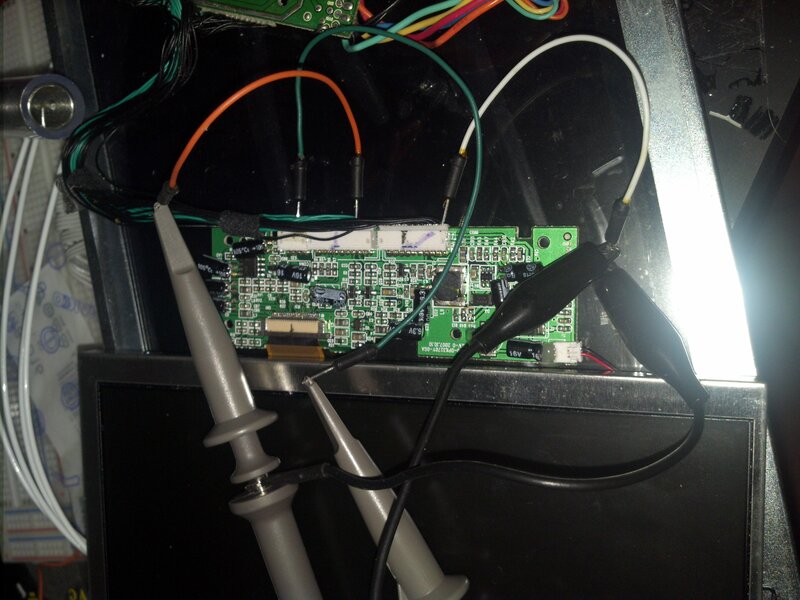 Once removed from the player, the LCD module and backlight is contained in a metal can, connected via a flat-flex to a small interface board, which conveniently contains the back-light driver as well. Its probably easier to just use the provided interface, so I examined the signals going into that. 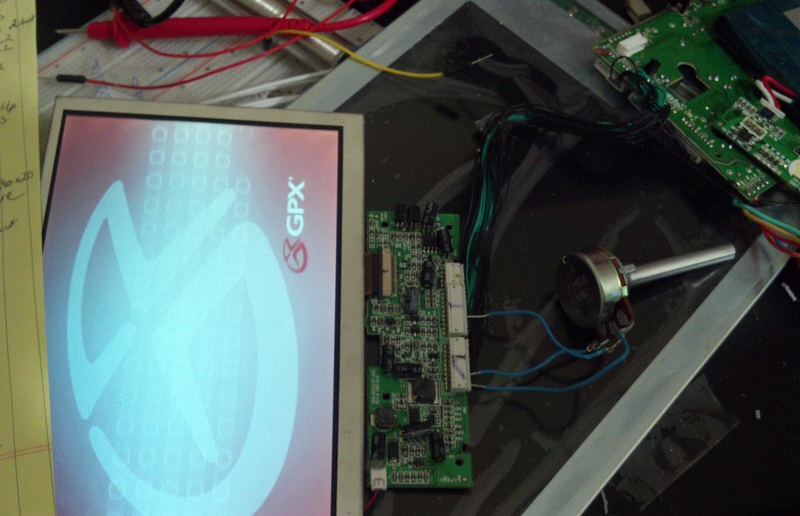 Luckily, the screen still worked perfectly, and I was able to power up the device outside of the body in order to get my scope on the pins. There were 24 pins in total, and helpfully, there where 23 labels on the rear silkscreen of the interface board. The below table shows those pins from top to bottom of the board (the side with the 4 pin connector at the top), along with the labels and my findings. I’m using an old 20MHz analog scope, so some of the measurements may not be precise. Also, be sure to set your probes to x10 for high speed measurements. More info here. 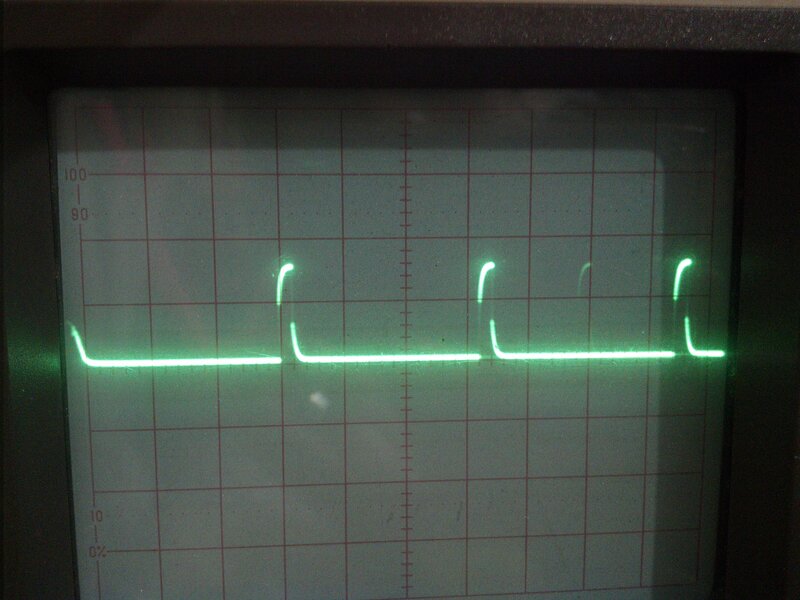 TFT_STH High pulse every 64uS, very short pulse. Based on the PCB label and speed, I’ll call this ‘Horizontal Strobe’. 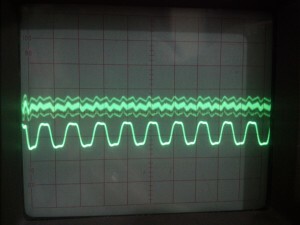 TFT_STV High pulse every 17mS, very short pulse. ‘Vertical Strobe’. Note that this timing shows about 265 ish Horizontals per Vertical. Also this implies 60 FPS. CKV 4uS High pulse every 64uS. 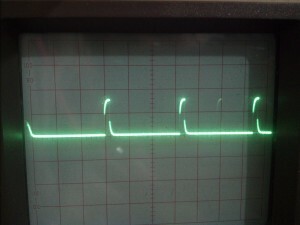 This pulse edge is 12uS before STH. ‘Vertical Clock’. CPH1 .1uS Squarish Wave. About 10 MHz. As the fastest signal. I’m guessing this is the Pixel Clock. Not sure if the wave appearance is the fault of the scope, of if more is going on in there. 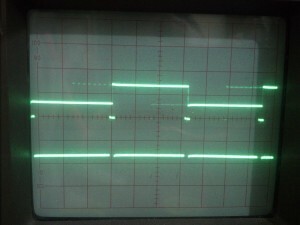 89P_VCOM 128uS Square Wave. Transitions in the middle of the CKV pulse. Seems to alternate high low every other line. TFT_R Pixel data. Red. 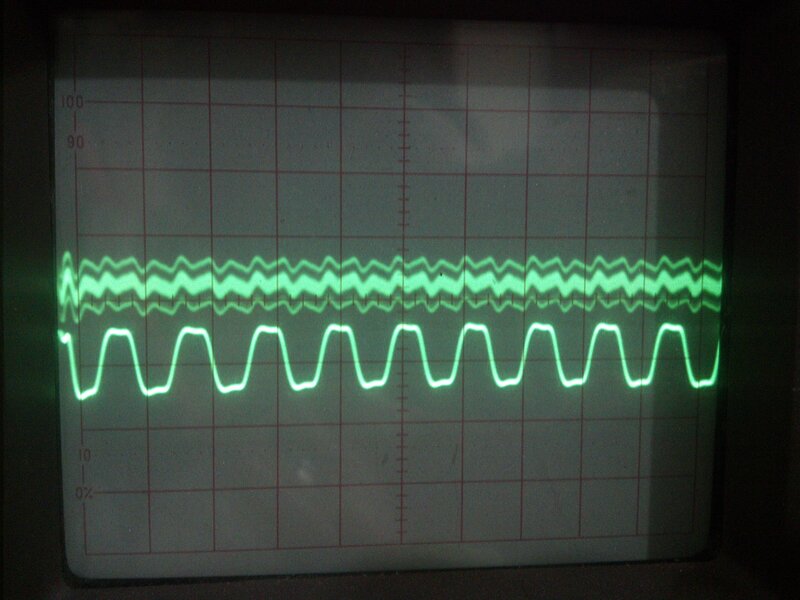 Couldn’t trigger on signal, but has patterns that align with pixel clock and CKV. Analog signal. TFT_G Pixel data. Green. 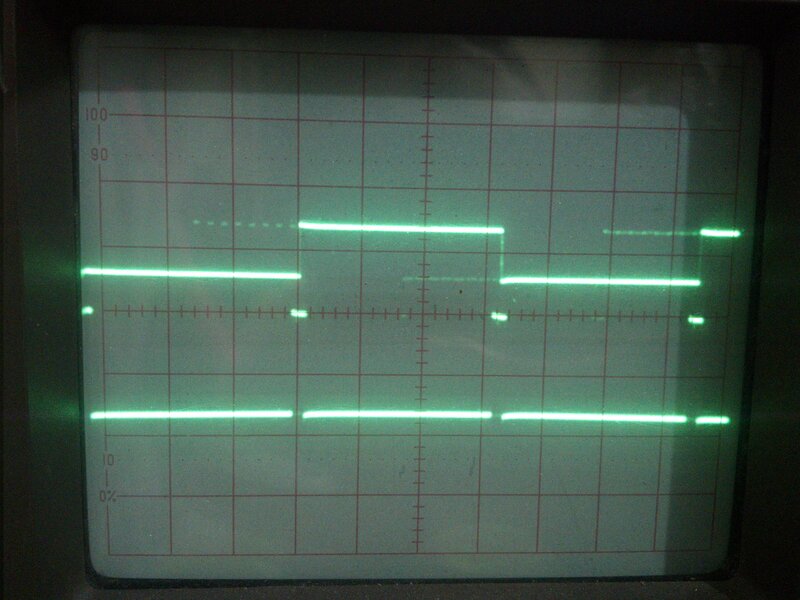 Couldn’t trigger on signal, but has patterns that align with pixel clock and CKV. Analog signal. TFT_B Pixel data. Blue. 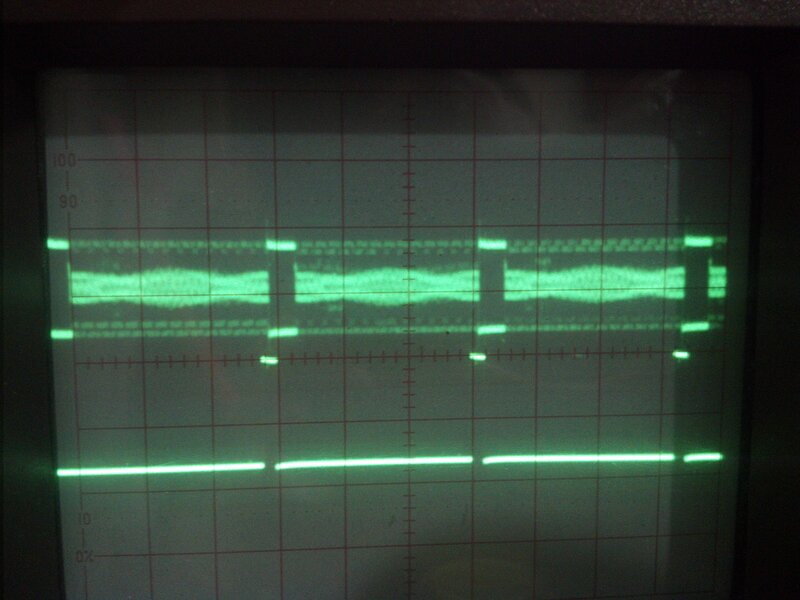 Couldn’t trigger on signal, but has patterns that align with pixel clock and CKV. Analog signal. BLVCC +5V. Must be for backlight. That actually paints a pretty cloudy picture of whats going on. Mostly because I cannot find the specs for this screen, so I’m going to have to guess the resolution. The vertical strobe shows that around 265 lines are transmitted per vertical clock pulse. That sounds like a good vertical resolution, but at 17mS per vertical strobe, that’s about 60 FPS. So there must be some kind of interleaving of data somewhere. That makes sense because the 89P_VCOM line alternates high/low for every other line. Possibly some type of high byte/low byte scenario? 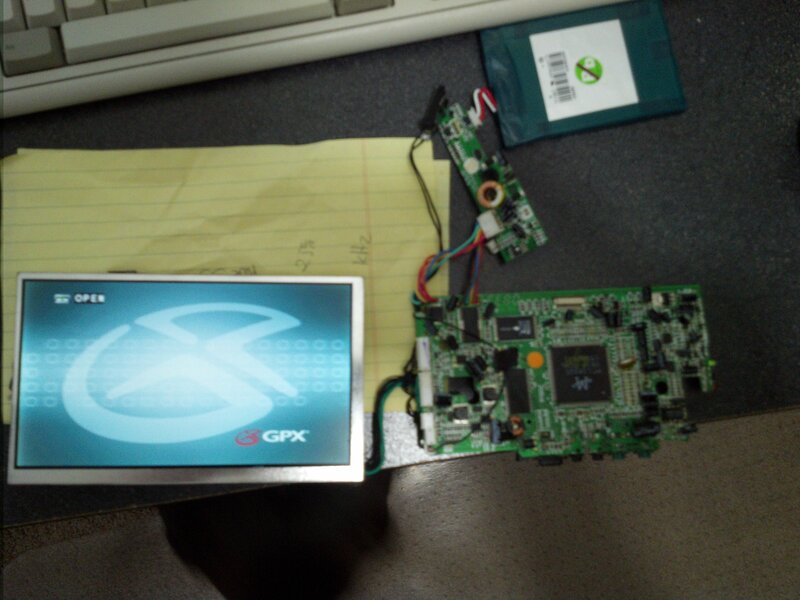 I ran the screen while holding this pin low, and the image became washed out. So its a possibility. 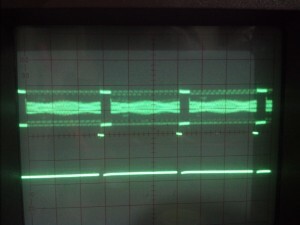 Since each horizontal strobe is 64uS, and the pixel clock is .1uS, this shows about 640 bits per RGB channel per line. Now, 640 sounds like a reasonable horizontal resolution. Originally this had me confused as I assumed the RGB pixel data signals were digital, when they were actually analog. That’s about all the info I can gather for now. I won’t be able to tell if my assumptions are accurate until I hook it up to something. I’ll end with my scope readings for those playing along at home. 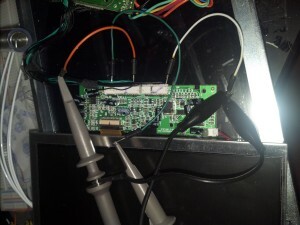 I was able to confirm that the RGB lines going into the panel are in fact analog. I attached a potentiometer between 5V and ground to form a simple voltage divider and attached the tap to the Red line. Turning the knob I was able to adjust the Red level of the image. Adjusting the analog red input.